Have you have ever been asked to play a show for free? Has your band ever been told by an organization that they “don’t have a budget” or that their budget is really small… or that they didn’t budget music into the equation? P.S. If you’re moving around and don’t feel like reading, this post, you can watch it by clicking play above. P.S.S. Everything in this post is available as a podcast episode on SoundCloud too. If you’re not getting paid for it, we’re going to talk today about how to get the maximum benefit from a free gig that has been offered to you. Maybe you’re the seasoned musician and you’ve seen some of the fresh artists who are new to the game and they are taking some of those opportunities and not getting paid. You think they are diluting the pool of good places to perform and training venue owners to devalue your work. The venue owner says, “Hey, we can get somebody else who will do it for free!” For you music veterans, this will show you, if you do decide to take on some of those exposure opportunities what to do so that you come out with a truly beneficial experience. Alright? 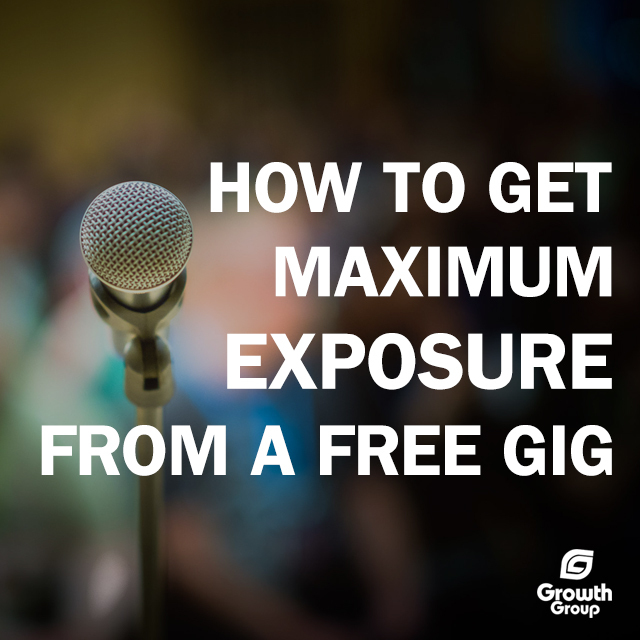 Today we’re going to talk about how to make exposure gigs beneficial for you, but also for the organization that looks to bring you in to perform. Then we’ll break down what to ask for or require of someone when they ask you to perform for free to truly maximize your reach with their audience. Why are we talking about exposure today? We want to make sure that you are getting the exposure but not being exploited, and that’s very important to remember. You don’t want to just go off of a hope and a prayer that somebody’s going to give you this great opportunity for exposure to their audience but it doesn’t truly work out for you. Introduce yourself to them and thank them for the opportunity. Remember, it was really bold of them and really it took a lot of guts for them to come ask you to do something for them for free, so make sure that you thank them for the opportunity to perform at their organization and for the exposure. More importantly, make sure that they know your intent is that this performance is mutually beneficial. You don’t want to do something where they’re getting all the benefit and there’s none in your corner. You want to make them aware of what you would typically charge for this sort of an event. The reason for that is because you want to ensure that they know in the future (should they call you back and ask you to do this event again) that they need to build this price into their budget. You can say something like, “I typically would charge $X.” Whatever that number is for you, whether is $5,000, $500, or $50, whatever it maybe you want to make sure that they are aware of that. If you aren’t sure what to charge or you have never really discovered what your minimum performance level is then one of the things you can do is join our #JustDoMusic series which is a FREE 5-day video series on how to quit your day job. What we go over in one of those sections is determining what your dollar amount should be when you’re going out and performing. Make your requests know (Yes, plural! Make multiple requests.). This is where we’re really going to dig into what is it that you can ask for that is going to truly give you the type of exposure that you want. Do a little bit of research into the organization to see what they’ve done for that event in the past and this will give you a good idea for what you can ask for. When you’re asking them for social media promotion what you’re going to want to do is give them some parameters. Tag – ask them to tag you! 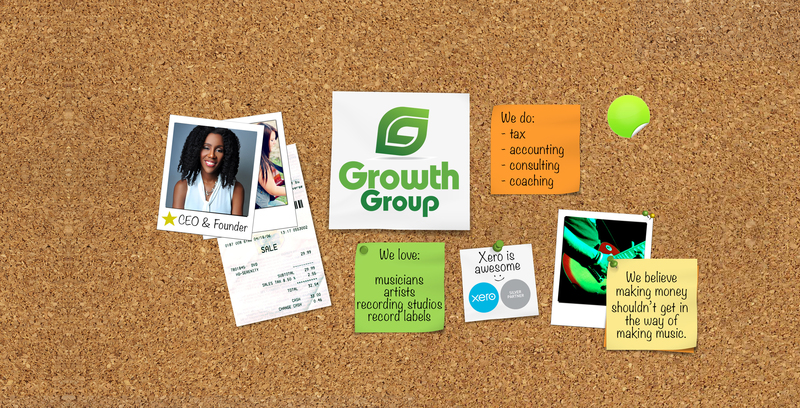 You want them to tag your @growthgroup on Facebook or @growthgroup on Instagram or Twitter. You want to make sure that they include your tag. Take to website -You want a link to back your website. Anytime that they’re putting out these weekly posts for you, you want to make sure that they take the person back to your website. The second thing that you can ask from them is email list promotion. For example, the nonprofit organization that I helped this artist secure had a large email list and they were promoting this event through that email list. We made sure to ask for the artist’s website and their social media profiles to be highlighted in all promotional related emails that went out about that event. Make sure when you ask them to put your information in e-mails that they include you in marketing e-mails, ticket confirmation e-mails, new announcement e-mails, and reminder e-mails. This alone could be HUGE. You want to ensure that you are included in any press releases, PR campaigns, or ads that they’re running. Make sure that they are highlighting you in that PR strategy. For example, if they’re putting out a press release to magazines, newspapers, and other media outlets, you want to make sure that your performance is included in that PR campaign. This is free promotion for you! You’re going to be singing at that event or your band’s going to be playing and they’re already paying for promotion and advertising, and you want to make sure that you’re included in that. Included should be your name, that you’re an award-winning artist, or that you’ve recently released a project or whatever else you can add into that PR campaign you want to make sure that you ask them for that as well. One of the things I always hear is, “they already paid a caterer,” or “they already paid a photographer and they paid for the venue. They paid for all these other things but they didn’t keep us in mind as musicians as entertainers.” Since they’ve already paid for it…ask your contact person for high quality, high-resolution video and three to five high resolution photos of your performance. You can use that media later on in your social media profiles and it’s something that you didn’t have to pay for yourself. The fact that they’ve already paid for these services works very, very, very well in your favor for future media opportunities. Those LIVE performance photos and video can later be given anyone who wants to see how you guys work on-stage LIVE and how the event went. You can also use those to help promote future events that you have. Another thing we asked for this artist was for a testimonial. We did that because they are now booking a tour and want good press, testimonials, and reviews from other venue owners. If this is an organization you’re willing to work with for free you want to make sure that you also get a review or testimonial that shows that you were great on stage, that you rocked the house, or that you had everybody dancing all night. This way other people will want to book you afterwards and you’re able to use that on your website or in your EPK. If this is an event where you are a guest or there’s some type of high-profile fundraising event, you want VIP credentials. You want to be seated at the head table, or at the reserved table. You want the same type of treatment that their keynote speaker is getting or that their other high-profile guests are receiving. This way you’ll be in the room with the “elite.” A lot of times you’ll hear, “there’s going to be big time industry people there” or “the mayor’s going to be there”, or “the governor is going to be there”, hell even if the President’s going to be there. Whoever it is, if they’re not paying you, you want to make sure that you are included in the VIP or high-level guest credentials, so that you can actually be able to make connections with those people and use those connections later to benefit your career. If the free gig is a ticketed event, they have tickets to give. Ask for a handful of tickets so that you can raffle those off or have a giveaway on your fan pages. You can use those for your own promotional efforts and have build a loyalty with your super fans. You don’t have to use all of these requests at the same time, but make sure that they’re in your arsenal, and request 2-3 of them from each free event you choose to do. Then give them the open floor to decide how they’d like to proceed. Maybe they’ll have a few changes here and there, like not having a videographer this year, but giving you 10 photos instead. You can work out the details, but at least they know that when they’re promising exposure that they’re truly giving you something that is also beneficial to you. These are ways to make sure that you truly do get the exposure, looks, audience, reach, and the engagement that you truly want from free gigs.